Cast your mind to the islands of Siam and it’s almost a guarantee a pad thai will feature in your fantasies. Thailand’s stir-fried noodle dish is a guaranteed crowd pleaser all the way from the streets of Bangkok to the tables of Hong Kong. Holly Graham seeks out the city’s most wok-and-roll pad thais. Cast your mind to the islands of Siam and it’s almost a guarantee a pad thai will feature in your fantasies. Thailand’s stir-fried noodle dish is a guaranteed crowd pleaser all the way from the streets of Bangkok to the tables of Hong Kong. Holly Graham seeks out the city’s most wok-and-roll pad thais Kowloon City’s moniker, Little Bangkok, is well justified. Though it may seem a trek for those not dwelling across the harbour, what with the lack of an MTR station, it’s infinitely quicker than a plane ride to Bangkok and the food is equally legit. 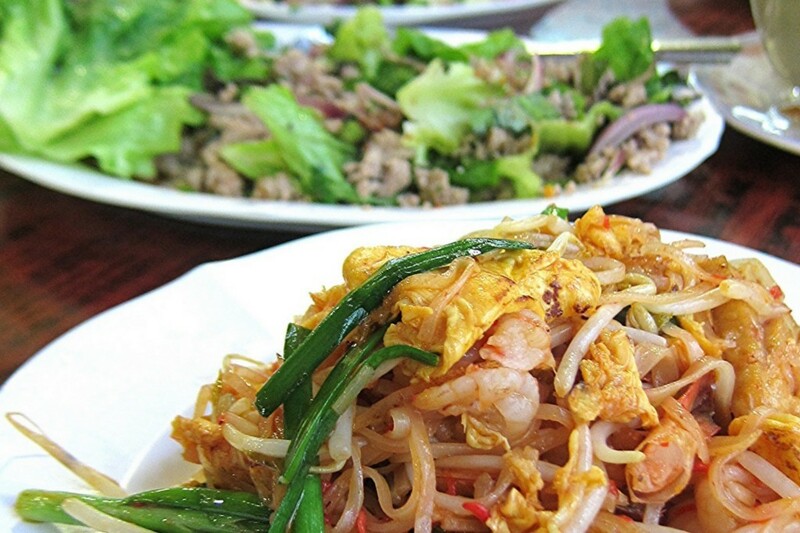 Our top Thai pick is Amporn Thai Food, housed inside Kowloon City’s cooked food center. The pad thai here is packed full of meaty prawns, peanuts and crunchy green onions. It compliments most of the dishes on the deliciously varied menu and the chefs don’t skimp on the spice either. $42, Shop 9, 3/F, Kowloon City Municipal Services Bldg, 100 Nga Tsin Wai Rd, Kowloon City, 2382 4622. Bright, comfortable and spacious, this stalwart serves up a vast menu of Thai favourites such as red, yellow and green curries as well as beautiful salads. The pad thai is wrapped in a slightly sweet omelet, making it a flavourful little packet with bonus egg. Open the package and tofu, prawns, bean sprouts and ground peanuts tumble out for the taking. Though not the fieriest pad thai on the list, it remains one of Hong Kong’s best. $99, 2/F-3/F, The Plaza, 21 D'Aguilar St, Lan Kwai Fong, Central, 2851 4803; cafesiam.com.hk. 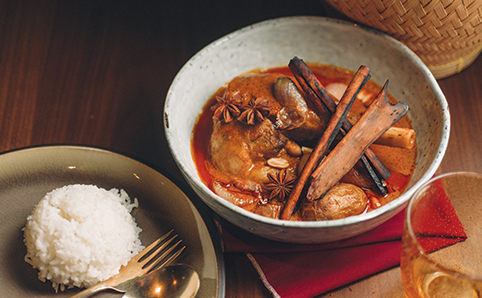 Yenn Wong’s latest addition to the JIA Group family showcases the cuisine of central Thailand. The retro interiors are reminiscent of an old-school shop house in Bangkok, resplendent with turquoise hues and hip quirks. The familiar flavours never fail to satiate our Siamese cravings and Mak Mak’s pad thai is one of the top choices here. 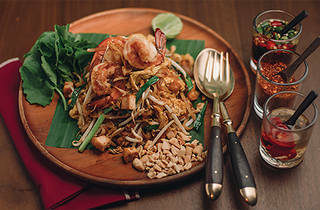 Stir-fried rice noodles are served with grilled prawns and tofu, roasted peanuts and sweet tamarind. 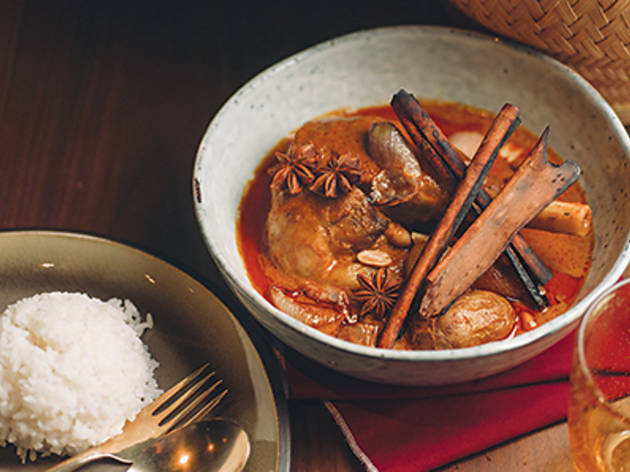 The newest and trendiest spot to chow down on this Thai classic, Mak Mak has substance with the style. $128, Shop 217A, 2/F, The Landmark Atrium, 15 Queen’s Rd C, Central, 2983 1003; makmak.hk. Taking advantage of the relatively quieter end of Tsim Sha Tsui East’s waterfront, Namo still affords stunning views of Victoria Harbour. 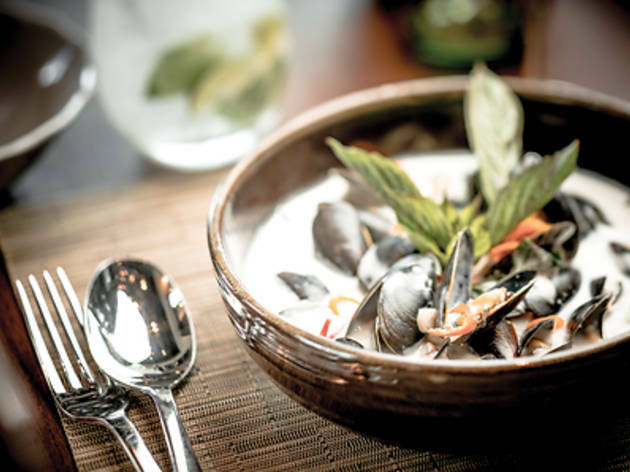 Touted as an ‘avant-Thai’ eatery, this innovative Thai restaurant gives the cuisine a contemporary breath of fresh air. Serving up Thai food using international ingredients and cooking techniques, Namo provides a noteworthy classic pad thai. Aptly named the Golden Oldie, this is a traditional pad thai served with prawns and topped with a crispy egg. A vegetarian option is served, too. $128-$148, Shop G18, Empire Ctr, 68 Mody Rd, Tsim Sha Tsui E, 2739 1133; mayfare.com.hk. This small and unsuspecting restaurant is a no-frills kind of joint, but if you’ve been looking for those classic roadside pad thai vibes, look no further than The Spice House. Sometimes all you need is a table and a pair of chopsticks rather than fancy concepts to enjoy the best Thai food. 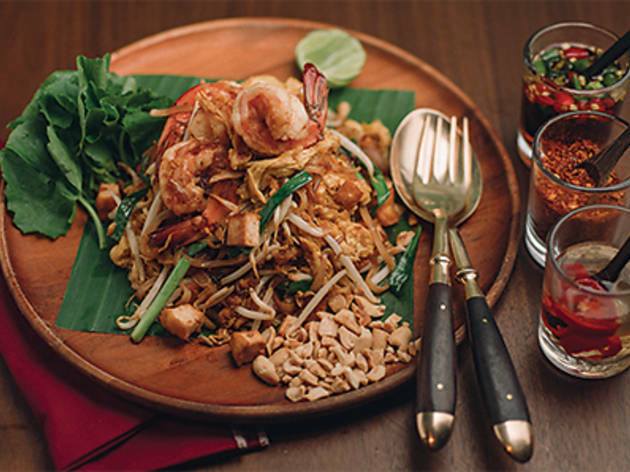 Tuck into the pad thai here and lose yourself in holiday memories of late night munchies near the beaches of Phuket. Cheap, cheerful and with just enough spice to keep both thrill seekers and spice fearers satisfied. $48, 35 Amoy St, Wan Chai, 2804 2522. 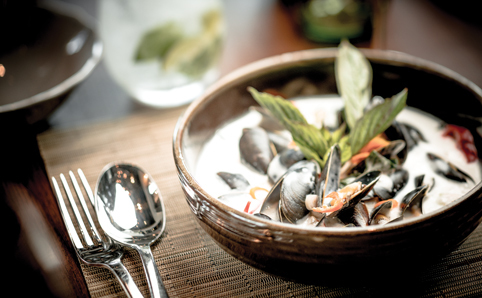 This vibrant bar and restaurant cooks up some innovative modern Thai recipes. The star of the menu is the incredibly Instagrammable pad thai lobster – a whole Boston lobster, plus noodles, bean sprouts, garlic chives, dried shrimp, tofu and peanuts. The radiantly red lobster is split in half, with the pad thai nestled in between the head and tail. It’s a spectacular sight to behold and equally as delicious. If you like your pad thai with premium ingredients, look no further than this indulgence. $328, 57 Wyndham St, Central, 2840 0041; soi7.com.hk.